All three MTK teams won today. I contributed a win on board 3 in a dramatic attacking game where I built up a winning position but finished inaccurately, accidentally allowing a forced loss and then a draw but fortunately these mistakes were not noticed by my opponent or myself during the game. I had played the middlegame aggressively and staked everything on a kingside attack with opposite colored bishops. This seemed like the right play as Black’s queen and bishop were both out of play on the queenside. Another nice Budapest tournament is underway. the field was limited to FIDE >2000 but a couple of players managed to be exceptions. MTK III won while MTK V lost. I contributed a win after misplaying the opening against the Slav on move 7. Now I played the planned 16.Nd6! and White regains the pawn with the threat of Nxf7+ forking the K+R and Nxb7. 16..Be6 17.Nxb7+ Kc7 18.Na5(diagram) The pawn is recovered and White has the better structure with the queenside majority and play against the isolated d-pawn. White continued with technical play and played to fix the kingside and create a second front with 32.g4 intending g5. However, the d5-pawn and a7 pawn are already two weaknesses but they seemed too close together to alternate against. There seemed no harm in playing to fix the kingside as Black had no active play and was not really threatening anything. White continued 39.Kd4 Be4 40.Kc5 and 1-0 shortly. * A Pénzügyőr SE III a 11. táblán erősorrendsértés miatt jogosulatlan játékost szerepeltetett, az általa megszerzett pontot a BEAC II számára jóváírtuk. Terbe Julianna(HUN) finished with 6-5/13 in a tough field. Terbe is one of the many rising young players on my team,MTK. Farkas Richard was clear first with 5.5/6. 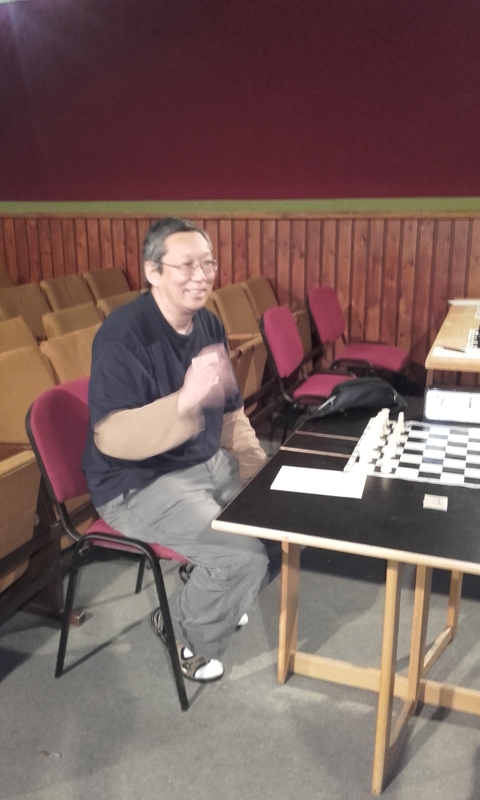 Vargyas Zoltan had a strong tournament and finished equal second with FM Koczo Kristof with 4.5/6. I lost both games on the last day to end up with a modest 3/6. White is a pawn down and out of moves so 0-1. I played the opening carelessly and White started off with a nice queenless game with little risk. After some complex maneuvering, and mutual inaccuracies Black was presented with a couple of chances but failed to exploit them. Black has managed to break up White’s queenside structure and has some counterplay but remains oddly placed. Here I missed the chance to strike with 23..b5! but I was afraid of 24.Nd6+ Kc7 25.Bb2 Ne6 and now Nd6 is trapped. Black will play ..Ng8/Be7 and the Nd6 cannot escape. I played 23..Bc7= and the struggle continued. Black still looks passive(Nc8/Bc7) but the game has turned to my favor. I should have played 30..Nd6! 31.Nxd6+ Bxd6 32.Ra1 Ra4! and Black is clearly better. In the game I settled for 30..Nb6= with a blockade of the b-pawn and later lost in a tough struggle. Marosi Levente, Laza Szabolcs my MTK teammates are part of a group in a 6-way tie for first with 2/2 after 2 rounds. I was quite shocked to see Budapest in the news(via Youtube) for this. ‘Thousands of refugees and migrants remain stranded at Budapest’s main international railway station after Hungarian authorities blocked them from boarding trains, preventing them from leaving for Austria and Germany. Hungary had an all GM contingent. Top Scorer was Rapport with 7/9.